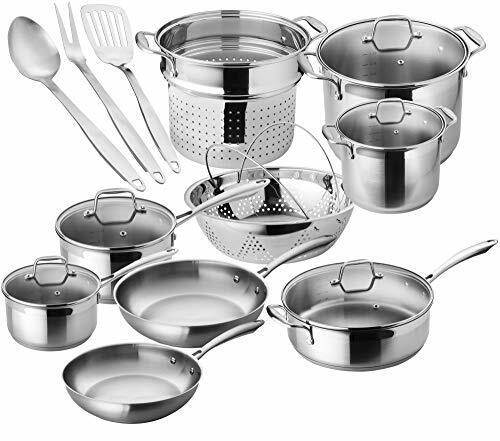 Selection of the best stainless steel cookware set is no rocket science. People who cook on a frequent basis can usually spot a good quality cookware easily. However, not everyone can do that. If you are also one of those people then you have come to the right spot. Why? because we have piled up the list of the best stainless steel cookware that you can choose from. So, take a look and order away. The Cuisinart MCP-﻿12N is the best high-grade stainless steel cookware in an affordable price that is enough for just about anyone’s cooking needs. If you are seeking an all-in-one stainless steel cookware with ample parts that can be used for cooking on any kind of stovetop, go for the Duxtop SSIB-17. If you want a professional level cookware that contains all the necessary pieces to satisfy all of your culinary yearnings, go for the chef﻿ star stainless steel se﻿t. The T-fal C836SC is an affordably priced set that comes with 12 different pieces of cookware. If you want both quality and quantity at a small price, choose the T-fal C836SC. If you are running low on the budget but you can’t compromise on the quality then go for the Cuisinart 77-10, which is an excellent amalgamation of quality and affordability. 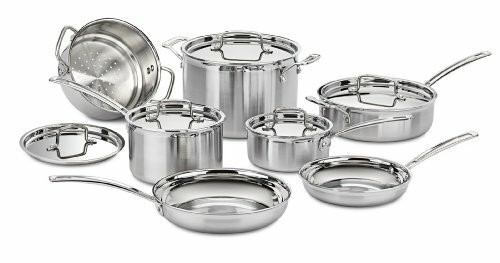 The Cuisinart MCP-12N Multiclad is a beautiful and A-grade set of stainless steel cookware that comes with 12 different pieces to fulfill your kitchen requirements. The bodies of the utensils are very shiny and lustrous due to having polished surfaces. No matter what you cook, the cookware will not stain or lose its color. All of the utensils in the cookware come with ergonomic handles and knobs that are easy to grip. And the tapered edges of pans ensure nothing drips while being poured. Due to having triple ply construction, the heat spreads around uniformly, which results in excellent cooking. You can also use the cookware for oven cooking or baking as it can stand a temperature up to 550F. It can even be used on induction cooktops. The cleaning won’t be an issue either, as the utensils are completely dishwasher safe. Whether you are a professional or just a home cook, this cookware will do fine for just about anyone of you. 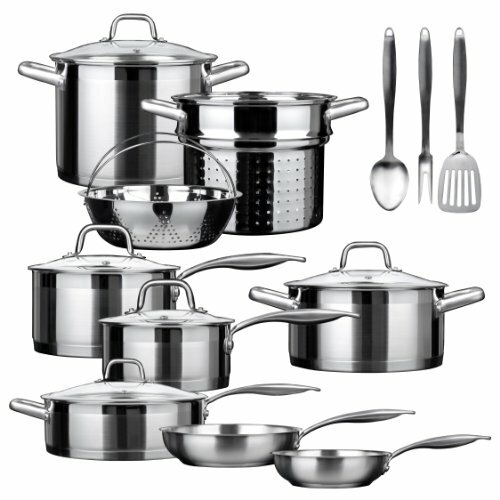 Our second choice is also a premium quality stainless steel cookware set that comes with 17 different pieces. You can use this sturdy and durable set for cooking on any kind of stove, be it electric, gas, ceramic, infrared, or even induction stove top. It works equally well with all of them. The cookware is made of the highest grade stainless steel material with an aluminum plate impact-bonded at the bottom. With this cookware in your house, you will never have to buy these utensils ever again because they will run for as long as you are there or for even more. The lifetime warranty that it comes with is a valid proof of that. The no-slip handles of this cookware are also ergonomically designed to provide you a comfortable grip. And they are attached to the pans very firmly so you don’t have to worry about handles coming off or getting loose. You can cook away all that you want and then simply wash it off in a dishwasher. It can also endure oven temperature up to 550 degrees and can be kept in the freezer for storing purposes. Another high-grade stainless steel cookware set that uses the impact-bonded technology, just like the Duxtop above, is the chef star professional grade cookware set. This highly durable set consists of 17 different pieces, which makes it a popular choice among professional chefs. The aluminum bottom of the cookware quickly catches and disperses the heat evenly all around. The anti-slip ergonomic handles are strongly riveted to the pans and pots to ensure maximum comfort and resilience. You can use this cookware on any kind of stovetops including the induction ones. The maximum heat it can take is up to 550F, so you can also use it for oven cooking. Even if you end up cooking a batch too big for your need, you can just store it in the freezer as it is, as this cookware can endure freezing temperatures too. The set comes with a lifetime warranty so just buy it once and be carefree for the rest of your life. Our next contender is the T-fal C836SC, which is a very affordable option for those people who do not want to go overboard with the expense. At a small price of $127, this cookware comes with 12 different pieces that can take care of your biggest cooking adventures. The stainless steel used in its construction is of the highest grade quality. The copper base of the cookware ensures that the heat gets uniformly distributed all across the utensils. The covers are made of glass with a small hole for ventilation for letting the steam out. The glass covers also help you to watch over the food getting cooked without removing them. Like all other sets, this one is also dishwasher and oven safe and can endure a temperature up to 500F. Although its price is low, it can be used on all types of cooktops including the induction stoves. If your spending power doesn’t allow you to buy any of the above-mentioned sets, then don’t lose heart because Cuisinart has just got the right thing for you. The Cuisinart 77-10 is a highly affordable set of stainless steel cookware. But, do not be deceived by its low price because just like any other premium set, it is also made of the highest grade material. This set is very exquisite and gorgeous looking and its polish gives it a beautiful mirror finish. The set comes with 10 pieces of cookware that include skillets, saucepans, stock pots and covers. The aluminum base of the pans results in retaining and distributing maximum heat evenly for quick and thorough cooking. All of the handles are firmly attached for providing you maximum comfort while gripping them. And despite its low price, this set is also dishwasher safe and comes with a lifetime warranty. Every cooking buff loves to have a set of stainless steel cookware in their kitchen because of a number of reasons. Not only home users, but professional grade chefs also prefer to cook in stainless steel cookware because of its high usability and convenience. Apart from usability, there are so many other benefits associated to stainless steel cookware as well that make it one of the most liked kitchen equipment by a number of users. Here, take a peep at them. One of the biggest benefits of getting one of these cookware sets is its high level of durability. You may find various other types of great cookware, but the durability that stainless steel cookware offers is unmatchable. These utensils are made to last forever without getting damaged. The steel material that is used in its making is usually very sturdy and robust and doesn’t stain very easily. The majority of these are scratch or stain resistant too and can be easily washed in a dishwasher. So, a stainless steel cookware is just about the only one-time investment that lets you reap its benefits all of your life. If you like pretty utensils, you are just going to love this cookware in your kitchen because it looks simply gorgeous. 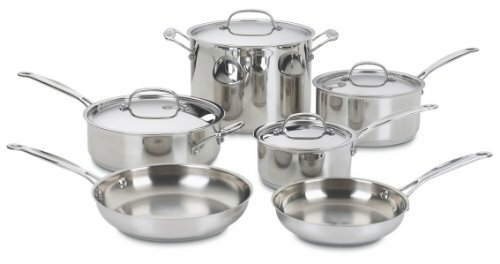 The “stainless steel” is the major contributor to the cookware’s beauty because it adds a glossy and smooth shine to it. All that luster makes every part of the cookware seem like a looking glass. And what’s even more awesome is that the glazing shine minimizes the cleaning time as well to a great extent. Like we just said above, cleaning of stainless steel cookware is a total breeze, which makes its maintenance a cakewalk. Most of such cookware is dishwasher friendly so this means you can get all the parts cleaned up in a jiffy. Even without the dishwasher, you do not need to use harsh and strong detergents for scrubbing the utensils clean. Just use your regular dishwasher cleaning agent and gently rub it on the parts with a cleaning sponge and voila! Everything will come off in a snap. Unlike the other fancy styled cookware, these utensils are quite pocket-friendly and have a higher degree of affordability for the majority of the people. There are even some sets that are specifically targeted for more budget oriented people. So, you see, there is something for everyone and that too in excellent quality. By versatility here we do not mean that you can use this cookware for something other than cooking. Because that’s plain stupid and is just not possible at all! It is versatile in terms of being equally effective for cooking just about anything without reacting to any of the ingredients. On the other hand, the majority of the other kinds of cookware develop stains when you cook any acidic or alkaline food in them. Secondly, stainless steel cookware doesn’t corrode or rust. This means you can keep it anywhere or under any conditions you want without any fear. How cool! If you start thinking about it, you may come up with multiple points that need thorough consideration before you buy your stainless steel cookware. But, not all of them are that important. Therefore, we have shortlisted the major points here that must be taken into consideration prior to selection. While buying anything, the factor that influences your selection the most is your budget. The prices of these cookware sets vary from one to the other on the basis of the material quality. The brand name also plays a bit of a role in it. You will find prices ranging from the lowest to the highest but you have to specify your budget in advance. This way, you will only check the sets that fall under your budget and won’t have to waste time on the ones that are too expensive for you. Try to go for the one that offers great value for money. You can find that out by comparing different sets and their prices along with the number of utensils they come. Well obviously the material used in these utensils is “STAINLESS STEEL”, so why bother thinking about it? Right? If you are having these thoughts right now then we are really sorry to burst your bubble, but stainless steel cookware is not made of ONLY stainless steel. A lot of people have this misconception about these utensils that they are made completely of stainless steel. This is not correct. Stainless steel cannot conduct heat efficiently that’s why it needs to be layered with other elements like copper to improve the heat conductivity. So, how can you ensure that the cookware you are picking is not a poor heat conductor? Well, it’s simple; you can check that through the stainless steel grading mentioned on the cookware. The grading is generally done on the basis of the amount of nickel and chromium that the steel contains. Here are the different types of grading you will see on stainless steel cookware. This grading indicates that the percentages of chromium and nickel that are present in the material are 18 percent and 10 percent respectively. This grading is found on the most premium quality cookware. These utensils do not only spread the heat uniformly but also resist oxidization and rust. If you want the best quality, go for the 18/10 grading. This grading indicates 8% of nickel content instead of 10%. The cookware sets with this grading are also very high in quality and possess all the similar attributes as the above one. The material with 0 percent nickel is not that smart of a choice because it may end up in corroding over the years. For the same reason, the sets with this grading are lesser in price in comparison to the above two. However, they do not just corrode on the first use and it takes years for that to happen. So, their quality is still considered to be pretty good. This grading indicates the most inferior quality construction material. These utensils cannot resist rust or corrosion so they cannot be kept for lifelong use. For the same reason, these sets are the most inexpensive of them all. Depending upon your usage and needs, make sure that the set you have chosen has all the necessary parts that are required in your everyday usage. In addition to checking the quality of the material, make sure to check how well constructed the handles and knobs are. If the construction is flimsy then don’t go for such a set. Similarly, the handles should be comfortable to be held and must be strongly attached to the pots and pans. Just as the number of the pieces, the sizes of the utensils are also pretty important. Make sure that your selected set includes the sizes of pots and saucepans that you generally use. Otherwise, it will be a bit difficult for you to switch to a new size in the beginning. Secondly, even if you are okay with the change, go for the sizes that you can comfortably handle and which can be easily kept in your kitchen without any storage problem. Usually, these sets come with multiple sized pots and saucepans so you will have plenty of choice in the kitchen. Just make sure that all of them have their own separate lids. When it comes to cooking, there is more than one reason to celebrate the greatness of the stainless steel cookware. Not only are these sets highly durable but also very affordable and low maintenance. That’s why every kitchen should have one of these. And while picking one, all you have to do is to make sure that it contains high-quality construction material. And the next thing we know is that you’ll be passing it on to your grandchildren in more or less the same condition.